New 2017 7-person family camper for rent. This is delivered fully holiday ready !! We have two identical campers for rent. Both are spacious and generously equipped 7-person family campers with alcove and bunk beds. Very nice, with two tables behind the driver's seats, so that you can enjoy the view on both sides while driving and when standing still. 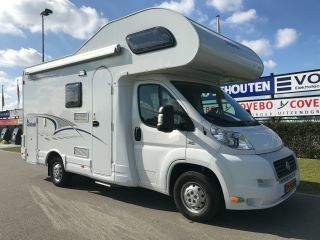 This motorhome was purchased new in 2017 and will be delivered ready for holiday. This includes full kitchen equipment including kettle, coffee maker and microwave. A complete camping set for outside, such as a nice camping table with comfortable chairs and a nice wok burner. Table tennis bats and badminton set will not be missing. 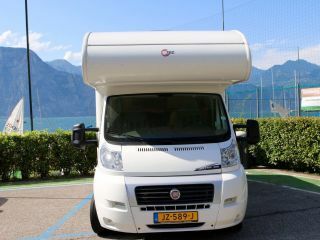 The motorhome is equipped with an efficient Euro6 engine, 6-speed, air conditioning, cruise control, airbags, ESP and Tomtom navigation with LIVE traffic !! The camper is standard equipped with an extra large refrigerator, screen door, awning and a 4-person bicycle carrier. 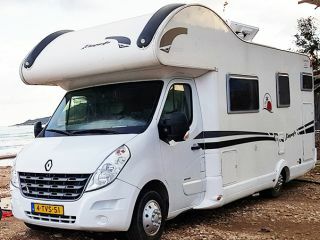 In addition, we offer the motorhome with the following insurance: replacement transport, replacement motorhome, necessary accommodation costs for repairs, damage insurance for occupants, transport costs for replacement accommodation / garage, breakdown assistance and breakdown assistance +. You can also opt for the towels and bed linen package and 18-speed rental bikes for an additional charge. In addition, you will also receive the 2017 camper place book and the well-known ACSI camping guides Europe 2017. Much possible in good consultation !! Enjoy months outside the peak season ?? Extremely high discounts !! In good consultation is much possible !! Bookings from Friday to Friday. You will receive it clean, please return it clean. You get it with full diesel and LPG tank, happy full back.